Warms the soul, sparks the imagination. Visiting places that have spent a great deal of money on their grounds is a perfect opportunity to see up close the best and the worst of landscape planning, and to continue learning from the big guys. At one very chic, eco-conscious and rustically contemporary (is that a style? 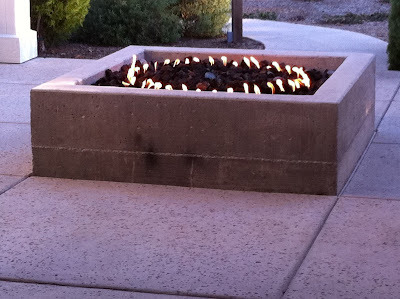 it is now) Napa Valley resort lives this charming concrete fire pit. This hearth is the heart of the outdoor "foyer" at the spa area; it is in the middle of a pathway, with no seating around it, so I'm guessing its purpose is not so much for literally warming oneself as for symbolizing the inner warmth the spa services nurture and awaken. I have a minor quibble with this — lowercase 'q' — because frankly, I enjoy sitting around a fire, and can't do that here without perching somewhat awkwardly on the narrow edge of the wall. (A typical depth for a seatwall would be about eighteen inches, to fit most posteriors comfortably; this is about six inches deep.) On the other hand, this might be intentional, to subtly discourage über-relaxed and probably slightly tipsy guests from sitting too close to an open flame. What catches me more are a couple of aesthetic issues. I will grant up front that these may have been conscious choices; however, even if they were, I don't agree with them. First, in this clean and contemporary resort there are lots of straight lines, which the fire pit's square shape complements perfectly. The circular fire burner, however, has no precedent that I can see. Granted, the resort's logo is circular, but this is not carried into the architecture or landscape. What's more, the circle-within-a-square feels busy and disruptive, not calming, to me. A square burner would have been better, and more in keeping with the overall geometry of the place. Funny how such a little detail can have such a big effect. for the concrete fire pit. Second, I noticed the horizontal seam about six inches above the pavement, about twelve inches below the top of the wall. This pit is solid concrete, which would have been poured into a "form" comprised of an inner wall and outer wall. 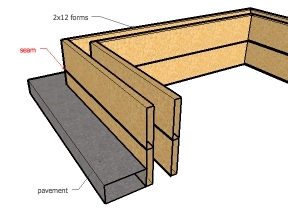 Most likely, each wall was constructed of one 2x12 board stacked on top of another to achieve a height of about eighteen inches above the concrete pavement (as shown in my little sketch). The seam probably resulted where the concrete oozed between the boards, as very heavy sludge is wont to do. Now, forming concrete is a talent I certainly do not possess. But the location of this seam annoys me. Could it have been a conscious design decision? There are other raised planters on the property with the same seam, but other than that I don't see any other precedent for dividing surfaces into 2/3 - 1/3 sections like this. And even if there were precedents, what does it mean? If it were an artistic statement, it should at least be intelligible. So I'm going to guess no, this wasn't an aesthetic choice. I'll guess it was a result of (a) going with the easiest solution to build; or (b) miscommunication between the landscape designer, who didn't specify how the forms should be built, and the builder, who didn't realize the aesthetic consequences of their methods. If I were the designer, I like to think, I would have realized a seam would be inevitable (because there would need to be at least two rows of boards), and would have specified that the seam be centered on the wall. 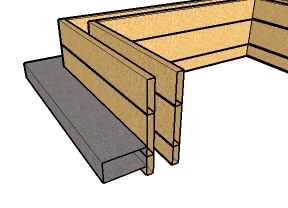 Yes, this probably would have meant using three rows of boards: a 2x12 top board ripped to be 9" tall (so the seam would be halfway down the 18" face), a 2x12 in the middle, and a 2x3 or 2x6 on the bottom. This level of detail makes the construction much more complex in the short term. So does custom-fabricating a square burner. But in the long term — and we designers are paid for long-term, big-picture thinking — I think it would be worth it if no guest (not even a nit-picky designer) ever looked at this otherwise wonderful resort's fire pit or planters and thought, "Huh. That's weird." Recently I delivered the installation plans — hardscape layout, planting plan, lighting plan, the whole set — for a very nice project. This is always a bittersweet occasion: while it's an exciting beginning of the "real" landscaping work, it's also the beginning of the end of my control over the design. From here on, my client will be working more closely with a landscape contractor than with me to define the details of construction, finalize choices for materials and plants, and probably "value-engineer" some changes to the design to make the project more affordable. Of course, none of this is unexpected, and I am always available during installation to consult on the design's evolution and retain the integrity of its concept. But, even as I rely on experienced contractors who will make my design even better in its execution, I also understand they may lead the homeowner in directions I hadn't anticipated or intended. Out of all the elements of a landscape plan, the plant selections are the most likely to change after the final design drawings have been submitted. Although I usually provide a preview of each specimen and its characteristics before I finalize the plan, often this is the first time the owner has seen all the plants in combination. Sometimes there's too much drama (this conversation usually begins with, "Wowww…"). Sometimes there are too many plants, sometimes too few (as in, "You sure they'll fill in?"). Sometimes, something else has caught their eye since the time they approved the preliminary plant list ("I really liked the Monkey Puzzle Tree I saw at the arboretum, so…"). I'm also keenly aware that most home owners aren't versed in reading planting plans. And despite having sat with my client to review the plans at length, they are after all a roadmap and not a narrative. Once I've left them in someone else's hands, it doesn't take long for all the circles and dots to blur, and the rationale of my excruciatingly considered choices and combinations becomes less apparent. Furthermore, even though I've checked to be sure all the plants I'm specifying are available at nursery, inevitably by the time planting comes around something has gone out of stock and a substitute will need to be found. 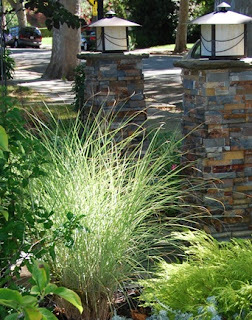 I try to ensure the contractor knows to consult with me before any changes are made, but sometimes it's not until I come over to fine-tune the planting layout that I realize that the drama of a backlit Miscanthus has been lost to a common Agapanthus, or a sedge that relishes "wet feet" has been replaced by a lavender that resents it. In these cases I can plead my case to the owner — you don't know what you're missing! — that plant will never thrive there! — but more often than not, they were fully aware of the change. I've had single plants and entire gardens ripped out and replaced, sometimes days after installation, sometimes months. The reasons vary, but it's always "nothing personal," the owners just wanted to try something different, or their gardener sold them on a different vision, or their tenant wanted lawn on which their dog might conduct business. It's their home, not mine, and ultimately all I really want is for the home owner to be happy with their landscape. If the changes fail, I know they'll call me back. And even if the garden does get installed precisely per plan, I know that nature will have her way with it and in a few years we'll all share our amazement at how that Miscanthus has grown so much bigger than any of us expected. This is just how landscaping goes, and I've come to not only live with the unpredictability but also learn from it. The circles and dots may be drawn with a pen — but the ink is never permanent.